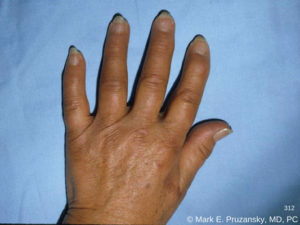 What is Osteoarthritis of the Fingers? Osteoarthritis involves wearing away of the smooth cartilage that normally covers the ends of the bones in a joint. This leaves a roughened joint surface that causes pain and swelling due to the abrasive surfaces and the body’s own inflammatory reaction. Excess bone (osteophytes) appear as well, as part of the degenerative process. The persistent joint degeneration and inflammation ultimately leads to stiffness of the joint. Pain and swelling are common symptoms. More advanced joint degeneration can lead to a visible deformity from osteophytes. Severely arthritic joints become stiff and difficult and painful to move. Symptoms usually present in middle age or older. The underlying reason for Osteoarthritis of the Fingers is little-understood, likely due to a genetic predisposition that leads to wearing out of the finger joints after years of use. A traumatic injury to a finger joint can also cause subsequent arthritis. Speaking with you and carefully examining your hands is essential to make the diagnosis. An x-ray is helpful to confirm the presence of Osteoarthritis of the Fingers and assess the severity of joint degeneration. Cases of mild to moderate symptoms can be managed with temporary reduction in activity of the hand, anti-inflammatory medications, occupational therapy, and cortisone injection. This regimen can allow continued use of the hand without having the underlying osteoarthritis limit you. Severe cases of crippling, chronic pain and an extensively degenerated joint on x-ray may indicate the need for surgery. Depending on the extent of symptoms, the condition of the joint, and which joint is involved, surgery may involve arthroscopic or open joint debridement, joint replacement (arthroplasty), or fusion (arthrodesis). For example, a severely arthritic first knuckle joint may be a candidate for debridement or joint replacement, to preserve motion at an important joint for function of the entire finger. A severely arthritic knuckle at the tip of the finger, though, would be a candidate for debridement or fusion in light of the small size of the joint and its important function in precision pinch and grasp. Osteoarthritis of the Fingers can present along a broad spectrum of symptom intensity and functional limitations. Call NYC hand surgeon Dr. Pruzansky at 212-249-8700 to schedule an appointment and obtain improved use of your hand. What is Osteoarthritis of the Wrist? Osteoarthritis of the Wrist is the degeneration of the joint surfaces that connect the eight small bones that comprise the wrist. The very smooth cartilage surfaces of each bone can be damaged or worn out, causing rough surfaces to rub against each other. The arthritis may be localized to just a few of the bones, or all of the wrist can be involved in advanced cases. Pain and swelling are common initially. 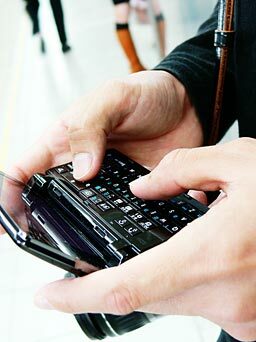 As the arthritis worsens there may be stiffness and difficulty using the hand and wrist. Commonly, prior trauma of the wrist can cause damage to the cartilage surfaces at the time of injury, setting the wrist on the path to developing arthritis. Ligament injuries may cause bone malalignment and leads to premature wear of wrist joint surfaces. Untreated fractures can also cause arthritis. In addition, a lifetime of heavy use of the wrist can cause overloading of some of the joint surfaces and lead to arthritis. Some people likely have a genetic predisposition to wearing out the wrist and will develop osteoarthritis without any other known factor. Different bones in the wrist are more commonly affected by osteoarthritis depending on the cause. Speaking with you to localize the main area of pain and performing a careful physical exam to distinguish between the several small bones in the wrist is essential to make the correct diagnosis. X-rays of the wrist will aid in confirming the diagnosis and assessing the severity of joint degeneration and how many bones are involved. Further imaging studies are usually unnecessary. More mild cases may be managed with conservative treatment involving anti-inflammatory medication, occupational therapy, splinting, and cortisone injection. Unlike the hip or knee, the wrist joint is not responsible for bearing the weight of the body, so it can generally tolerate the presence of arthritis better. A conservative treatment regimen can help to reduce inflammation and pain while preserving motion so that you may continue to enjoy using your hand for work and hobbies. Cases with significant pain unresponsive to conservative treatment may benefit from surgery. Surgical treatment can include arthroscopic debridement or partial wrist fusion (arthrodesis) if only part of the wrist is involved. Fusing part of the wrist can reduce or eliminate pain, while generally reducing wrist motion by about half. In situations where ligamentous or bony injuries underlie the arthritic process, repairing them in a timely fashion may improve the arthritic condition. When the entire wrist joint is severely degenerated, surgical treatment requires either complete wrist fusion or total wrist replacement. Osteoarthritis of the Wrist may cause difficulty with using your hand. Call NYC Wrist Surgeon Dr. Pruzansky at 212-249-8700 to schedule an appointment and re-introduce comfort to your wrist. Osteoarthritis of the Elbow is the gradual wearing away of the cartilage that covers the bones of the elbow joint. The elbow joint is composed of three bones. The arm bone – the humerus – primarily moves with one of the forearm bones – the ulna. In addition, the humerus moves with the other forearm bone – the radius. Osteoarthritis may affect all three of these bones or only two of them. Pain and stiffness are common. It is possible for the elbow to be stiff with minimal pain. The stiffness can progress and result in contracture of the elbow. Clicking of the elbow may be noticed as well. Sometimes the little finger and ring finger in the hand may feel numb or tingly. This occurs because the ulnar nerve, which runs right along the inside part of the elbow (“the funny bone”), can become irritated and/or compressed by the arthritic elbow joint due to its osteophytes. As with the wrist, Osteoarthritis of the Elbow most commonly occurs when a prior traumatic accident has damaged the cartilage surfaces due to fracture or dislocation. Since cartilage does not heal normally once it has been damaged, the injured joint surfaces are no longer perfectly smooth and the path to osteoarthritis often begins. Prolonged heavy use of the elbow, such as decades of construction work, can cause gradual overloading of the cartilage. Chronic overuse can also occur in baseball pitchers due to the stress continually placed on the elbow joint during the pitching motion. This stress can cause damage to the supporting elbow ligaments, which may leads to premature wear of the joint surfaces due to instability. Speaking with you and performing a careful physical exam to assess areas of tenderness, ligamentous instability, and limitations in motion are essential. X-rays of the elbow will confirm the diagnosis and aid in evaluating the extent of the osteoarthritis. Sometimes a CT scan is helpful if surgery is being considered and there are large osteophytes and significant joint deformity. MRI may show ligamentous injury. If there is numbness in the little finger and ring finger, a nerve study (NCS) can be obtained to evaluate the extent of ulnar nerve injury caused by the adjacent arthritic joint. Anti-inflammatory medication, physical therapy, and minimizing stress on the elbow can help reduce pain and improve motion. More advanced cases of osteoarthritis, especially when there is extensive osteophyte formation that creates a bony block to motion, may benefit from surgery. Arthroscopic debridement can be performed to remove some osteophytes and damaged tissue, while also smoothing irregular joint surfaces. Arthritic elbows with large osteophytes and more significant joint contractures of the soft tissues may need an open surgical debridement, including an Osteocapsular Arthroplasty. Cases involving ligamentous instability with only mild arthritis can benefit from ligament reconstruction (like Tommy John Surgery) to arrest the arthritic process. Total Elbow Replacement is reserved for severely damaged joints in older, low-demand patients. Osteoarthritis of the Elbow can be a nuisance or quite disabling. Call Dr. Pruzansky at 212-249-8700 to schedule an appointment and improve the condition of an important joint.